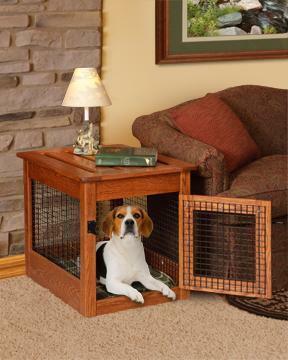 Featuring sturdy wire grating, this end table solves the “chew” problem. Plus, with this beautiful end table, you’ll never again have to deal with an unsightly crate taking up valuable living space. Bottom Options: Plain: Choose this option if you have your own mattress or tray to put into the dog box. Foam Mattress: This is a 3" foam mattress. Waterproof Linoleum Tray: This waterproof tray protects your floor and is the easy to clean option.